Household Refrigerators And Freezers Market size was valued at over USD 59 billion in 2015 and is set to grow at 2.7% CAGR from 2016 to 2025. Growing energy efficiency initiatives and rising purchasing power of consumers would drive the global household refrigerators and freezers market size over the forecast timeline. Capabilities of pairing smartphones with refrigerators and the advent of compressor less products contribute towards the key technological advancements witnessed in the industry. 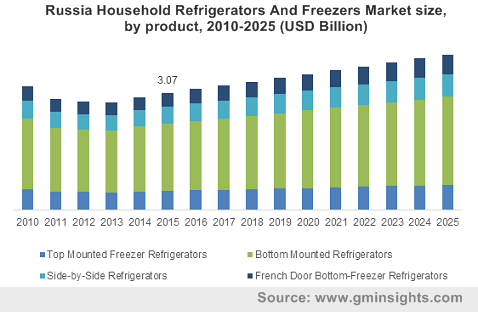 Household refrigerators and freezers market size may witness considerable growth owing to stringent energy regulations for improving energy efficiency. The refrigerators built in 2011 required only 25% of the energy to operate as compared to the models built in 1975. With improving efficiency to meet standards, manufacturers have increased the refrigerator size by 20% and provided user-friendly technological advancements such as through-the-door-ice, water tap on the door, and more buying options for consumers. The Department of Energy has made the fourth energy upgrade in less than 40 years for the 100-year old industry. Refrigerators that perform beyond the minimum energy standards qualify for the ENERGY STAR label. Manufacturers are investing in R&D to develop household refrigerators and freezers for continued efficiency improvements. These progressive energy-efficiency standards have translated into huge savings for consumers as manufacturers have responded with new innovations. The energy efficiency standards were last updated in September 2015 under which new models need to cut their energy consumption by 20% to 25%. These new standards are anticipated to save about 5 quads of energy over the next 30 years. French door bottom-freezer refrigerators market accounted for over 25% of the overall volume in 2015. Growing demand for technically advanced products with comfortable position for opening and closing doors will drive industry demand. Side-by-side refrigerators market share is projected to grow at 4% CAGR from 2016 to 2025. Increasing consumption of frozen and fast foods in urban regions will drive consumption from 2016 to 2025. Rising demand for higher capacity frost-free devices has also shown a steeper growth in the past few years. Many established players have shifted their focus toward the higher-end spectrum with the introduction of premium products. The premium high capacity side-by-side refrigerators are gaining popularity among middle and upper-middle class owing to increasing number of double-income families which prefer more storage space. Furthermore, easy financing options, maintenance free compressors, and increased life cycle would support the demand over the forecast period. Increasing disposable income and requirements for energy efficient products is responsible for Europe household refrigerators and freezers market share forecasts. The energy efficiency upgrade in September 2015 will contribute to rising demand for environmentally friendly products in the U.S. household refrigerators and freezers market. Newly launched models would reduce the energy consumption and operating costs making it reliable for consumers. Moreover, features such as automated temperature adjustability, smartphones connectivity, automated food ordering and desire for having second refrigerator are also forecast to increase demand. Changing lifestyles in rural areas will drive the household refrigerators and freezers market size from 2016 to 2025. Significant investments by government in the rural electrification will also support the rising demand. Affordable single door or direct cool refrigerators are expected to be the largest selling units in these markets. With an increase in manufacturing technologies and globalization, products available for all income levels are affordable. Major industry participants contributing to household refrigerators and freezers market share include Electrolux, Samsung, Whirlpool, Haier and LG. Other prominent players are General Electric, Bosch, Panasonic and Frigidaire. Key players are focusing on providing more advanced features to consumers with extensive product portfolio to gain competitive edge. For instance, In January 2016, LG introduced its signature model in the U.S in its premium high-end category. This technology lets users browse through the contents of the fridge by a double knock on the opaque glass, which turns transparent. In the same year, Samsung introduced a new line of refrigerators at CES 2016 in the U.S. It can cement the fridge’s position as the centre of the kitchen offering the technology to convert a freezer to the fridge or vice versa to meet food storage requirements. A household refrigerator is a small cold storage space where food products such as milk, ice-cream, fish, meat, vegetables, fruits, water, etc. can be stored at low temperature. These products make use of vapor compression system for maintaining storage conditions. The sizes of household refrigerator vary from about 100 litres to 600 litres. The products are available in wide array of sizes and styles depending upon the consumers. The basic configurations are refrigerator with freezer, top-mount, bottom-mount, side-by-side, French-door, chest freezers and upright freezers. Upright refrigerators are the simplest models having a single large door with the refrigerated space & freezer compartment on the back. These models are more economical than others but are less energy efficient as more energy is required to cool the freezer when the door is opened.